Hello, dear reader, and welcome back to the Balboa Victory Dental blog! As you are probably aware, we here at Balboa Victory Dental are dedicated to making sure that as many people as possible in the Encino area are able to have a dentist that they can rely on to handle all of their dental needs. We have helped thousands of Encino area residents over the years and, quite frankly, nothing makes us happier than being able to say that we have helped to make sure that people’s oral health is as good as possible. In our previous post, we went over some of the reasons that home whitening treatments for teeth are something that is better left to professionals and, in today’s post, we are going to continue to cover some of the reasons that we feel dentists do a better job at whitening teeth than an over-the-counter treatments could ever hope to. Continue reading below to learn more. It’s no secret that most people wish they had whiter teeth. Even the most diligent of brushers will eventually notice that their teeth are not as white as they used to be. Unfortunately, as we age, our teeth naturally lose their whiteness. Years of repeated exposure to foods and beverages that work to stain the teeth is something that people just had to live with. However, that is no longer the case. Teeth whitening services have been available at dentist offices for years now and, even more recently, over the counter options have made quite a splash in the home whitening field. However, these home kits are not all they are cracked up to be. Below, we have listed a few more reasons that we feel prove that having your dentist whiten your teeth is preferable to purchasing and using over the counter teeth whitening products. Quick Treatment: While the whitening products that you purchase from your local drug store may be able to provide results, chances are good that you will have to use the products over a course of a few weeks to see any actual results. This is due mostly to the fact that these products have such a low level of peroxide in them, the agent that is responsible for actually whitening your teeth. This is done in an attempt to make sure that people don’t damage their teeth, however, it also means that it takes a lot longer for these products to work. On the other hand, when you visit your dentist to have your teeth whitened, you can see the results you want after a single, hour-long treatment. Long-Lasting: What’s the point of going through a whitening treatment if the results only last for a few weeks? 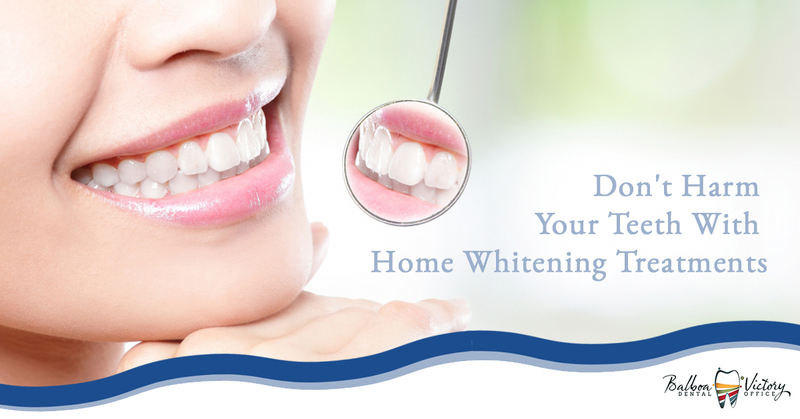 When you choose to use home whitening treatments, there is no guarantee that the results will last. Because these home treatments use such a small amount of peroxide, they may give the illusion that they have whitened your teeth while, in reality, they have simply whitened the surface of your teeth. Not only will your dentist provide a deeper clean than any home whitening treatment could hope to deliver, they will often provide you with a home maintenance kit that contains custom whitening gel designed to make sure that your teeth stay whiter for longer. Safety: As we stated in our previous blog, using teeth whitening products at home can be dangerous. These products can work to strip the enamel of a person’s teeth and, in some cases, can cause burns on the gums, lips, and insides of a person’s mouth. Luckily, when you go to a dentist to have your teeth whitened, you can rest assured that your safety is of the utmost importance. Not only dentists are bound by their trade to provide the safest services possible, it is in the best interest of their business to do so. Additionally, when you visit a dentist, they can advise you on the reason why your teeth are stained. In some cases, excessive staining is caused by dental issues that can only be fixed with the help of a dentist. If you figure out that something else is causing your teeth to become stained, you can avoid accidentally damaging them through repeated whitening attempts. Thank you for taking the time to read our short blog series on the benefits of having your teeth whitened by a dentist. If you would like to learn more about the services that we provide, please get in touch with us today at Balboa Victory Dental. We are an Encino dentist office that is dedicated to providing the best services possible for as many people as possible. Contact us today and let us show you what makes us the best choice!